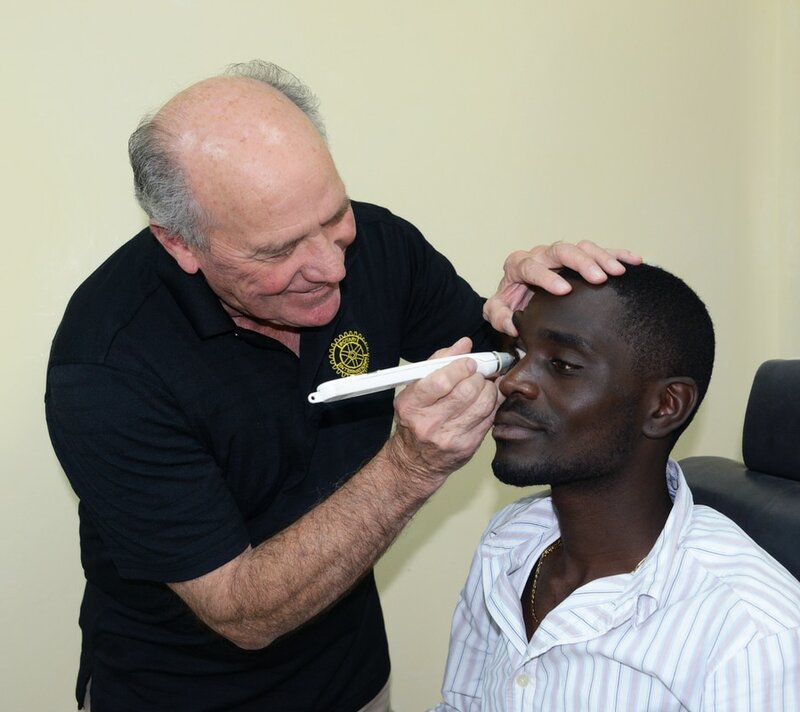 Dr. James “Bud” Tysinger became interested in eye surgery after graduating from medical school and attending a medical mission to Sierra Leone in 1970. During the trip, he assisted an ophthalmologist with a variety of procedures, including cataract surgery. His experience made him realize he wanted to help people in developing countries. Because his permanent home was in the U.S. and not in Sierra Leone, he believed ophthalmology — particularly cataract surgery because it requires minimal follow-up — was his best opportunity to fulfill his goal. Back in America, Tysinger started a private practice in 1978 in Antioch, California. A member of the Rotary Club of Clayton Valley/Concord Sunrise, he persuaded fellow Rotarians in the area to donate money and accompany him to Africa on medical missions. In 1994, along with former medical partner Dr. Robert Grosserode and ophthalmologist Dr. Thomas Brumley, Tysinger founded International Vision Volunteers. That year, a civil war began in Sierra Leone, preventing further visits to the eye care center IVV established there and prompting the organization to start working in Zambia. Tysinger enlisted his sister and brother-in-law to build an eye clinic in the village of Zimba, and donations funded a guest house for volunteer ophthalmologists and assistants. Since then, IVV has conducted thousands of cataract surgeries and related operations on patients that sometimes travel for days and camp out for several weeks to receive care at the clinic. On top of opening the clinic, Tysinger encouraged IVV participants to make other contributions to improve Africans’ lives. Dr. Jim Green, a dentist who assisted on several missions, noticed a need for dental care and created a dental clinic. This inspired California Rotarians Sheila Hurst and Laura Day to create Kenya Smiles, an initiative to improve the oral health of Kenyan children. Hurst also converted two cargo containers into a library in Zimba.